Tjong A Fie (1860–1921), or Tjong Yiauw Hian was a Hakka Chinese businessman, banker and kapitan (Chinese major) who built a large plantation business in Sumatra, Indonesia. Tjong A Fie built his business that employed more than 10,000 labor workers. Because of his great success, he maintained a good relationship with the ruler of Deli, including Sultan Deli Makmun Al Rasjid and Dutch authorities. In 1911, Tjong A Fie was appointed as a Kapitan Cina (Majoor der Chineezen) or major of Chinese community in Medan, replaced his late brother, Tjong Yong Hian. As a Chinese community top leader, he was well-thought-of and respected by people, because he was linked with economy and political systems of the city. His enterprises were invested in his plantations, palm oil and sugar factories, bank and railroad. Tjong was a prominent figure in the development of Medan, as seen through the construction of various buildings utilized by the citizens of Medan past and present. These buildings include Tjong A Fie's Mansion, located in Ahmad Yani Street near the Kesawan area, the Old Mosque or sometimes known as Crooked Alley Mosque, and the clock tower of Medan City Hall, which is located in the intersection between Radan Saleh Street and Kesawan. At year 1911, Tjong was appointed as Kapitan Cina (Majoor der Chineezen) to lead the Tionghoa community in Medan, replacing his brother, Tjong Yong Hian. Tjong was a highly respected person; he was also a master of the economics and politics of Medan. His business kingdom covered banks, railroads, plantations, which included palm oil plants and sugar plants. While he carried out his duties as a Kapitan, Tjong succeeded in developing his individual business and the city of Medan. One of those developments included building the Kesawan Bank as a forerunner for financial security in Medan. The construction of educational facilities, hospitals, houses of worship and other public facilities has made Tjong as an incredibly influential figure in Medan. These developmental projects were supported by the close relationship of Tjong with the Sultanate of Deli, the ruler of the Land Deli (also known as Medan) at the time. Back in China, Tjong married a woman with the family name of Lee. Upon arriving in Medan, he married a lady named Chew from Penang and had three children, named Tjong Kong Liong, Tjong Jin Song and Tjong Kwei Jin. Mrs. Chew died a few years later for unknown reasons. There is no historical record of these three children after the death of Mrs. Chew. Tjong married again several years later to Lim Koei-Yap from Binjai. He had seven children from this marriage. Tjong's grandchildren had not known each other due to the fact that when Tjong died, they were split apart at a young age and were moved overseas to countries including Malaysia, Singapore, Netherlands and Belgium. Communication between them was lost and to this day, and Tjong's descendants have had problems identifying each other. Tjong's long-time residence is located at Kesawan Street, Medan. 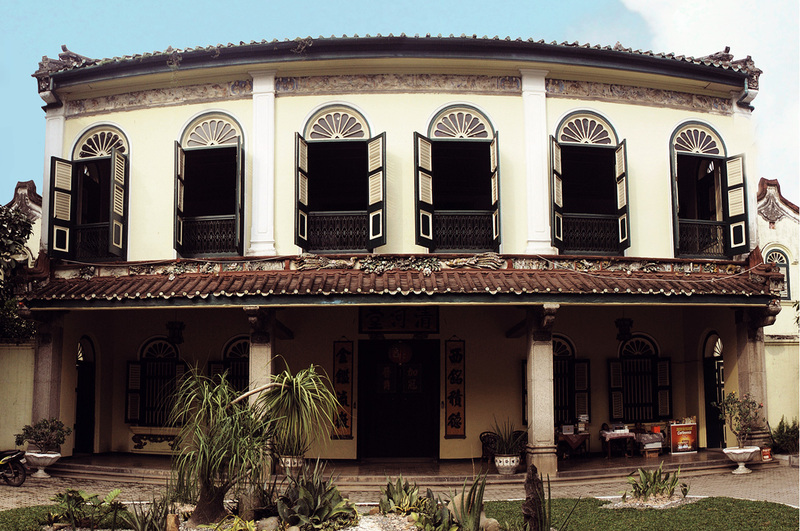 The mansion is an architectural mix of Malay, European, and Tionghoa styles and contains forty rooms, each lined with hand-painted floor tiles from Italy and the walls depicting life in China with great detail. The Tjong A Fie Mansion consists of two floors with each floor having its own designation. The first floor consists of several important rooms, including the right side of the house reserved for ethnically Chinese guests only, while the left side of the house has a room reserved for the Sultan of Deli and his family or guests. The middle room on the ground floor is a reception room for guests—the room has a door ten meters tall and has a Chinese-style wooden door handle. On the back of the ground floor, there are spaces for ancestral worship, private rooms, and Tjong's family room. The top floor of the building is used as a ball room or meeting room; there is also an altar facing the meeting room used as a means of worship by Tjong and his family. The mansion has two doors, the entrance of which is facing the Ahmad Yani Street in Kesawan and the exit of which is facing the Red Cross Street. The mansion spatially segregated men and women where the right part of building was intended for men and the left for women. This division was not limited to Tjong and his family, but also to guests and workers who settled in the mansion. Construction of the mansion was completed circa 1900. In 2000, it was included in the list of cultural heritage landmarks protected by legislation in the city of Medan. The mansion has been open to public since 18 June 2009 to commemorate Tjong A Fie's 150th birthday and has been a popular tourist spot.